Welcome to the best condo in Waikiki. Located in between the world renown Waikiki Beach & Ala Moana Beach Park, our Ilikai Marina condo is the perfect destination for travelers looking for relaxation, luxury, adventure, beauty, and romance. Whatever you are looking for, our Ilikai Marina condo is the perfect choice for your visit to Oahu. The building is steps away from the Pacific Ocean & Duke's Lagoon. The views are dramatic from the living room, bedroom, and lanai. Rainbows, coral reefs, sailboats, and sunsets are visible year round from the comfort of your oceanfront balcony. Our Ilikai Marina condo is at the quiet end of Waikiki's finest attractions. Aside from it's breath taking white sand beach, Waikiki is home to fabulous restaurants, shopping, museums, tours, and a bustling night life. 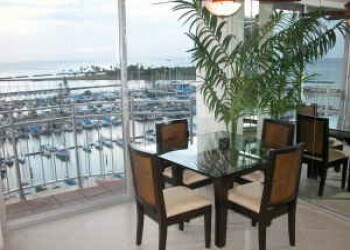 This condo is newly renovated and beautifully furnished. Enjoy the king size bed with a memory foam mattresses, 50" TV', fully loaded-modern kitchen, extravagant bathroom, washer and dryer, and free parking. Rent directly from an owner and know what you are renting rather than taking a chance on receiving a non upgraded accommodation. This is NOT the Ilikai Hotel. The Ilikai Marina Building views are not obstructed side views facing only one direction or looking over another balcony. If you do not immediately recognize that this is the best value accommodation in Waikiki go ahead and bang your head real hard on the table a few times and when things start to make since give us a call so that we can put you in our beautiful oceanfront condo #1382.